"Forgoing sleep is like borrowing from a loan shark. Sure you get that extra hours right now to cover for your overly-optimistic estimation, but at what price? The shark will be back and if you can’t pay, he’ll break your creativity, morale, and good-mannered nature as virtue twigs." This quote, from a post called "Sleep deprivation is not a badge of honor,"by David Heinemeier at 37signals, really caught my attention. 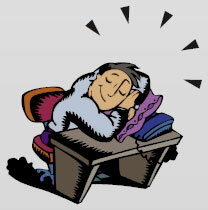 Like overwork, some people seem to be proud of how little sleep they get. Yet, as he points out, you pay for the extra time that you eke out by sleeping less. Reduced creativity is clearly one price you pay. I'm particularly sensitive to this as someone who needs a lot of sleep, and whose husband doesn't. This NY Times article reviews recent research on the role that sleeping plays in the formation of new memories and in the consolidation of recent learning. As a matter of fact, this recent study shows that a 90 minute short nap can speed up the process of learning a new task and remembering it long term. So don't make the mistake of thinking that the extra hours of the day gained by sleeping less are really doing you any good. Better to get adequate sleep, and then approach the tasks that require your creativity and memory capacities with a well-prepared brain.